Is it spring yet? It’s been another week of strong winds, rain and sleet, and personally I think it’s time for a change. I don’t even bother looking outside now to find out what the weather’s doing: if the water in the toilet bowl has waves with white caps then I know it’s windy. During a lull in the storm on Saturday I risked an expedition to Tesco, just 10 minutes up the road. By the time I got there I looked like an extra from one of those Deadliest Catch shows on TV, where trawlermen risk life and limb for a handful of lobsters; though my catch was a box of vegetable protein imitation fish fingers from the freezer aisle, which doesn’t carry quite the same element of manliness and danger. Still, if someone had been sailing just a few feet above me in a hot air balloon tipping buckets of water over my head I couldn’t have been wetter. But what do I care? For we finally have a roof over our heads we can call our own, or will do by the end of the week. We’re (finally!) on the verge of buying our house in Wick, in what everyone refers to as the “posh part” down by the river, not far from where I’m living now. I’ll say more next time, not least because the purchase has dragged on so long I can’t remember which house we’re buying any more; but we won’t be moving in till mid-February, to give us time to sort ourselves out. Meanwhile, on with the gansey. As you’ll see from the photos, I’ve embarked on the first sleeve. I’ve learned to keep the armholes to about 8-9 inches including the shoulder straps, because with the drop shoulders the sleeve already effectively starts an inch or so down the upper arm, and with the gussets you don’t start to decrease the sleeve for 3 or 4 inches. So you have to be careful not to make the sleeves too baggy. 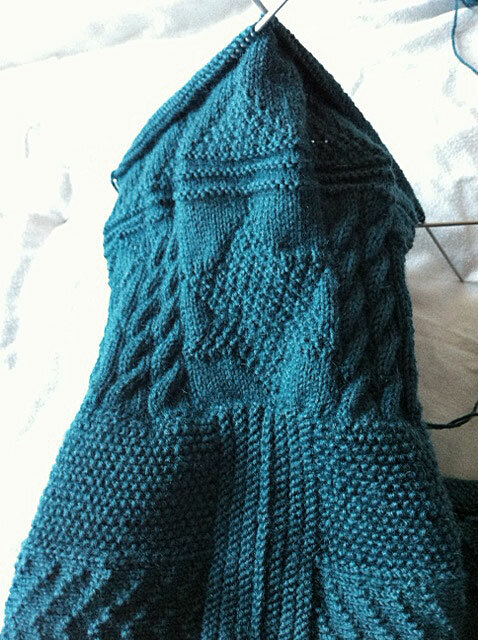 I had a total of 159 stitches for the whole sleeve, excluding the gusset. What patterns to choose? I opted for the central star, flanked as before with double cables, and then on each side of those a diamond panel and another double cable, all exactly as per the yoke. 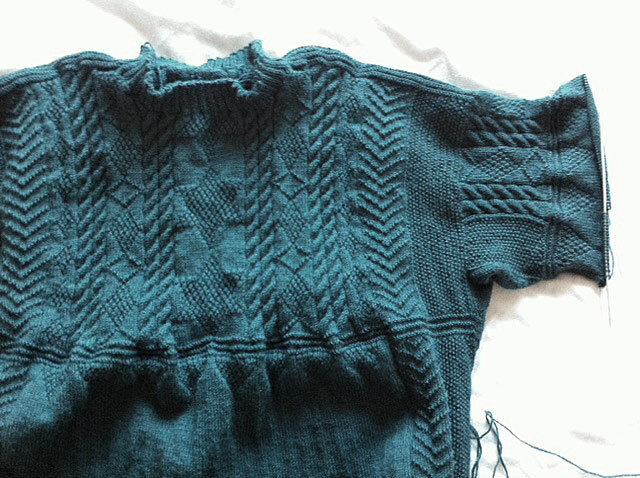 There weren’t enough stitches to replicate the entire yoke, so something had to go: reluctantly I abandoned the little diamond panels and the chevrons, and stuck with the moss stitch panel, which I hoped would make a strong contrast with the other patterns. I have to be careful with gansey sleeves where the yoke is patterned but the body is plain: if I’m not careful, the pattern can run down the sleeve too far, so that it covers the elbow, which doesn’t look quite right to me (unless, of course, you’ve opted to pattern the sleeve to about halfway down the forearm, which they sometimes used to do). In this case I restricted the length to the length of the centre star, and then added the 3 purl rows to delineate the end of the pattern. But I thought it would be a nice touch to add the hanging half-diamonds from just below the yoke to the sleeves as well, and give it all a sort of unity. I’d already decided not to replicate the way the body has the moss stitch and chevron panels running the whole length of the seams, though with some regret. As I said above, there weren’t enough stitches to do everything (and I wasn’t sure they’d work so well in a tube); plus I feared lest the decreases down the sleeve would ruin the effect – so in the end I chose to knit the rest of the sleeve plain. But it could have gone either way. I’m fascinated by this guernsey pattern and can’t wait to see it on someone to get the full effect. Best of luck on the house, Gordon. Hope it will be cozy and you won’t have to do any DIY for years to come. Best of luck on the weather, too. This has definitely been an unusually bad year for Scotland. But I was just reading of a bright spot: Is Wick getting any of the Northern Lights (assuming there’s dry patches when you could spot them)? I’m so glad you gave me the armhole stitches you’re working for this gansey. On last year’s Frangipani Claret, I did a total 151 for the armhole, but I’m working on Alice Starmore’s Cape Cod right now, and she wants 174 stitches on this one! I’m not anywhere near that point yet but I’ll definitely be referring to the stats I kept last year. Great news on the real estate purchase – does that mean Margaret will move in with you? Anxious for photos. It’s a very effective pattern, isn’t it? The Humber ganseys definitely deserve to be celebrated more, I think. Haven’t seen any Northern lights, alas. Sunday was too cloudy, yesterday I forgot to look and went to bed (d’oh!) and today it’s back to wall-to-wall cloud. So I don’t know if they’ve come to Wick or decided to holiday elsewhere. HAve you seen any? 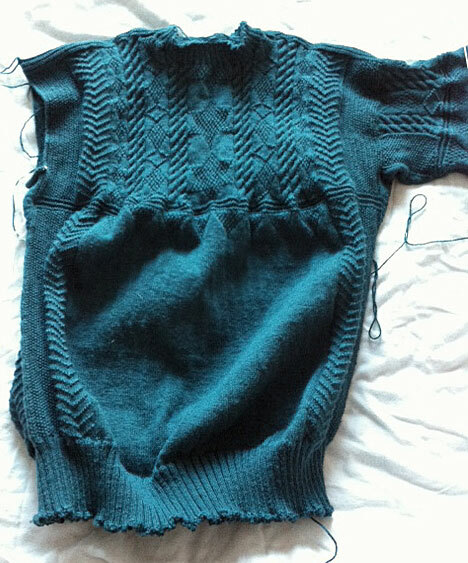 The early ganseys I knitted followed the advice I read that the armholes should be about 10″. This is one reason why the Patrington & Withernsea gansey in the gallery has quite generous sleeves! It took me a while to figure out that the traditional knitters must have kept it shorter, given how figure-hugging the old ganseys were. But I’m always nervous lest I run out of stitches before the cuffs – not that I ever have. We’re in the stressful just-before-completing stage – and although the rules are different in Scotland, so no one can back out now, there’s still lots to coordinate. And then we have to pack up and move, and sort out utilities, and phones and all that stuff. Luckily I’m not wearing my blood pressure monitor just now! I switched on the lights for you! The gussets are where the first stage of the rocket separates and you soar off into space. Or something. Ah, Lyme Regis! We used to live in Taunton, and my job was travelling all over the south west helping museums, libraries and archives. So we often used to toddle down to Lyme, one of my favourite places in England – though it always seemed to be a building site when we visited! I guess it’s also famous because of Jane Austen’s Persuasion or The French Lieutenant’s Woman. But it doesn’t really need help. Love the sleeves! They are really lovely, and the color, while not in my favorite color family (blue-green just does nothing for me usually) is growing on me. Have exactly one official project to get off the needles and I start my first gansey! I think Dad’s pretty touched; he offered to BUY the yarn! He and my mom have got to be some of the best knitting recipients on earth. Hope your weather gets better, and that the move goes well! And thank you. I regret the passing of the “old” conifer, which was a more – what’s the word? – tawny, flecked appearance (see the Patrington and Withernsea gansey in the gallery). The Frangipani, though perfectly fine, does knit up into a straight dark green effect. But it does show up the pattern well, and seems appropriate for ganseys, dunno why. Oh, wow! Thanks for the link, Judit! Gordon, like you I have never seen the lights. We’re too far south in the Netherlands and I’ve never been smart enough to vacation somewhere appropriately northern when it was happening. For that matter, I’ve never vacationed any further north than the Danish border. Hmm, just found a niche to fill. Hi Veronica ! I am happy reading that you looked at the northern lights link ! It seems to me very often that the world ends at the Danish border. And this is not reality, there is a wonderful northern world up here.